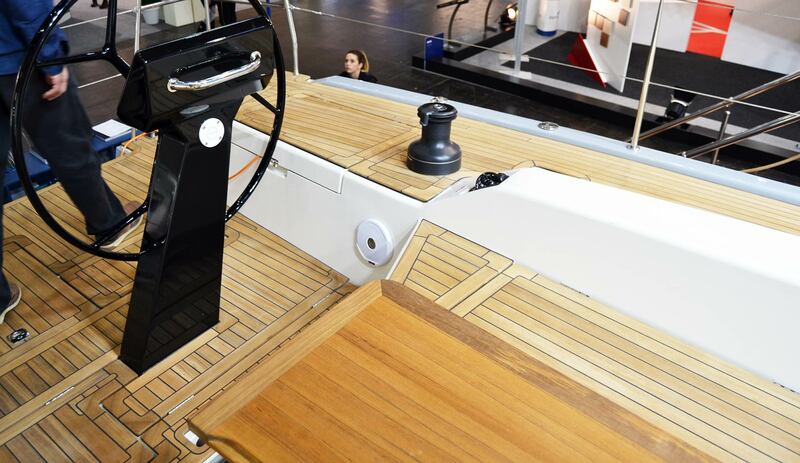 When I was strolling the BOOT Duesseldorf boat show at the first day – the show wasn´t even open at this moment, the lights haven´t been switched on yet and it was quiet, peaceful, the walkways empty – I also came by a booth that was a bit hidden behind the large stand of Dehler Yachts. Somehow cramped in the last corner of the hall, two yachts were exhibited and one of them catched my imagination at an instant. I stumbled upon More Yachts and I said … wow! I heard of the More Yachts Venture at some point but honestly wasn´t really interested that much so the surprise was even bigger when I walked around the grey hull of the More 55. What a beauty, I thought to myself, and beautiful she really is! The More 55 has been designed by renown designer Maurizio Cossutti back in 2015 but she looks incredible and is far away from being dated (which I sadly enough cannot say from one of my all-time favourites, the Dehöer 46). I instantly fell in love with her lines. She´s a damn fast looking beast for sure! The hull is very, VERY flat compared to modern day cruisers with a high freeboard. She has a beautiful slight, almost not noticeable sheerline, an even flatter superstructure on deck, integrated bowsprit and very exciting lines – no matter where your eyes hit her. The sleek portholes in her hull are a concession to the contemporary trend but they appear this thin that I am curious if there´s light coming through at all. The one and only thing I disliked about her design had been the trim strips and the type designation on the hull which to my eyes appeared a bit too big, a bit too much. But the rest … just candy for the eyes! After another day of the show concluded and so did my work day I jumped over to the stand again and asked for permission to board the boat. I was so curious to see her interior. More Yachts was founded by the Croatian Einar Haldin, then boss of More Charter, a charter company, who was unsatisfied with then available charter-boats. He wanted a boat suitable for charter on the one hand but capable of all-out regatta racing and high performance-sailing on the other. So he decided to design and build his own boat. 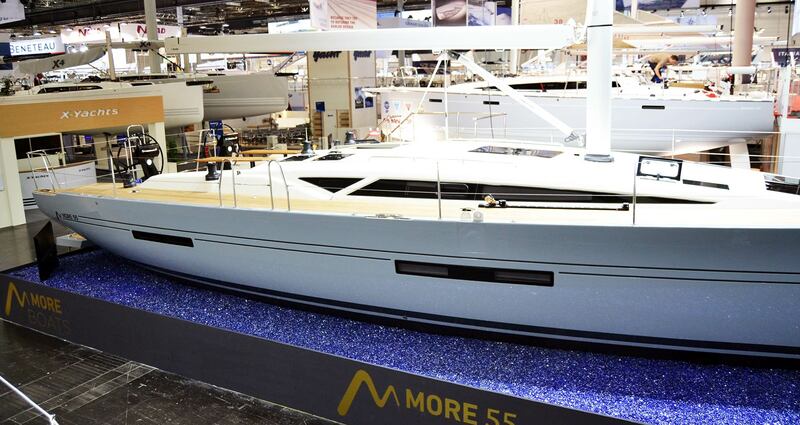 In collaboration with Maurizio Cossutti and a Croatian yard the More 55 (and now the More 40) was born. On the outside I first took a look at the superstructure. The windows are sleek, black and racy. They imply speed and a modern, aggressive look. 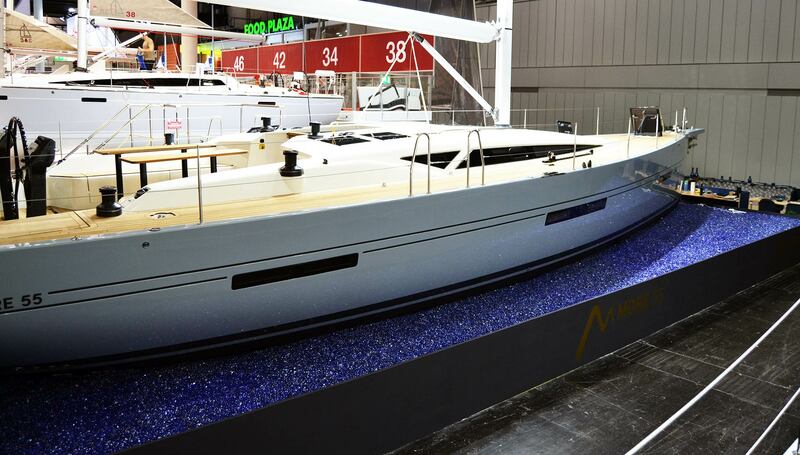 No wonder, Cossutti designed the More 55 with modern TP 52-racing boats in mind. I particularly liked the cat-like split window with a kind of a-column to the aft. Very racy. Walking on deck I instantly noticed the strong built – under my feet I didn´t felt the “GRPish” budging. The cockpit is huge. There are two steering wheels on massive (but slim) pillars. Winches and thus the layout of the lines is traditional so that this boat can be raced by a crew where each member has it´s own dedicated post. Another detail against the common trend in cruiser design to have all the winches located back at the steering wheels to allow single handed sailing by the helmsman/skipper. This yacht is really meant to be sailed and raced by a dedicated sailing crew. A bit odd in my eyes the somewhat cheap looking cockpit table – but I think that´s a solution meant to be easily handled and then stowed away even more easy. What was hitting my eyes instantaneously was the incredible effort that went into Teak decking. 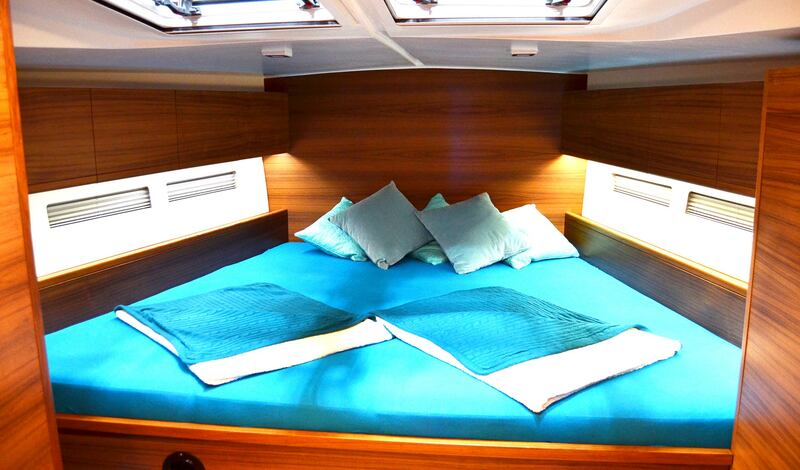 The quality of the built is enormous and very rarely seen these days on production cruising boats. Normally you would see a base plate (plywood or harder wood) with Teak batten glued to the base and then the whole thing glued to the GRP deck. Not with the More 55: Here I noticed very nicely crafted Teak batten arranged in the classic way with complete embrasures – no matter where I looked, the Teak decking had been mounted very, very accurate and stunningly beautiful. Also, the thickness of the material is far above average. Whereas you get a 3 or 4 millimetre Teak scantling, on the More 55 this looks like 5 or even 6 millimetres. 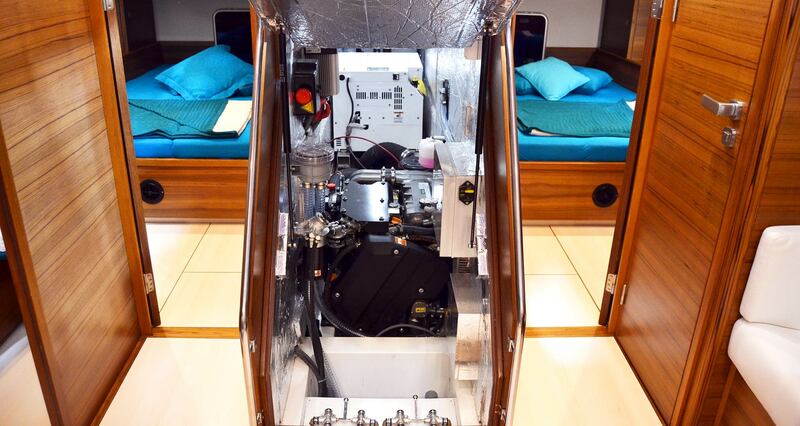 Look at the details around the steering posts and on all the hatches and covers: There´s a lot of effort going on here and the proud owner (or charter guest) on a More 55 will have eye-candy for shore while staying in the cockpit. I was excited to see this. Even on the far end of the hull´s freeboard it was astonishing to see that the yard was putting so much effort in applying the Teak decking with a classic embrasure. The caulking was as accurate as one can make it and I am sure the owners will have a long time to admire this fine piece of craftsmanship because also due to the material thickness the Teak decking of the More 55 yacht can be refurbished and even sanded to a fresh new shiny surface quality many, many times over again. My heart – wanting to go down below deck I hesitated when I saw the two folding doors and the big slide hatch of the entryway. Almost classic: Thick, really thick massive Teak-made doors, what a beauty! So simply but plain and thus beautiful. Not the common plastic doors, even here for this otherwise regarded unimportant detail the designers put so much effort in creating something beautiful here. You won´t get a door like this on modern day cruisers. The smile on my face didn´t go away all the time being aboard this fine vessel. Down below the smile grew even brighter. Maurizio Cossutti was doing magic things here, I noticed. 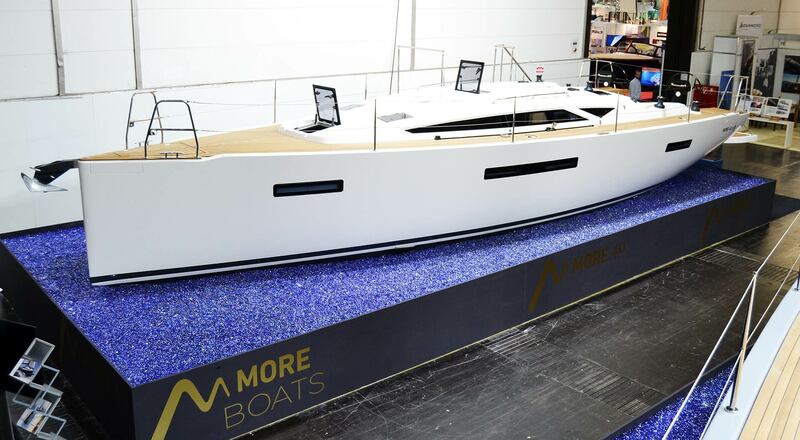 And when there might have been even a slight hesitation whether a Croatian yard could really build a high quality boat, aboard the More 55 these doubts are rendered irrelevant at an instant. The interior just blows your mind. 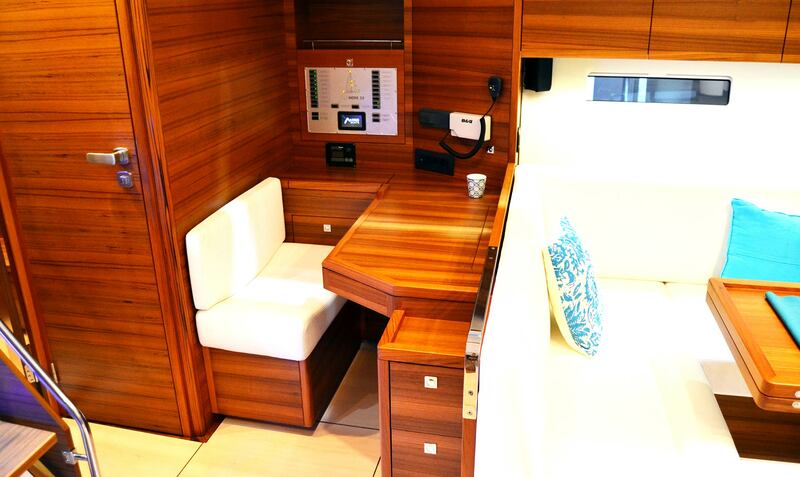 The saloon is very wide – well, this is a 55 feet yacht and has plenty of room of course. But the allocation of the elements like galley (a classic longitudinal galley at starboard side), the lounge area with a large U-sofa and a single stool, the navigation station with the chart table is done with caution: On the one hand there´s enough space left to create a lofty feeling, on the other hand the things are arranged in a way that one gets to grab a handle from every single point in the room to have a safe stand even in harsh weather conditions. The chart table! What a beauty again! You know that I have a passion for chart tables and I give credit to all yachts and yards which refrain from making these small, iPad-sized tiny flding tables cramped somewhere in the boat on the oddest places more as an excuse than as a real working place. The chart table on the More 55 is a full fledged big sized working station for a real skipper doing real chartwork and stuff. 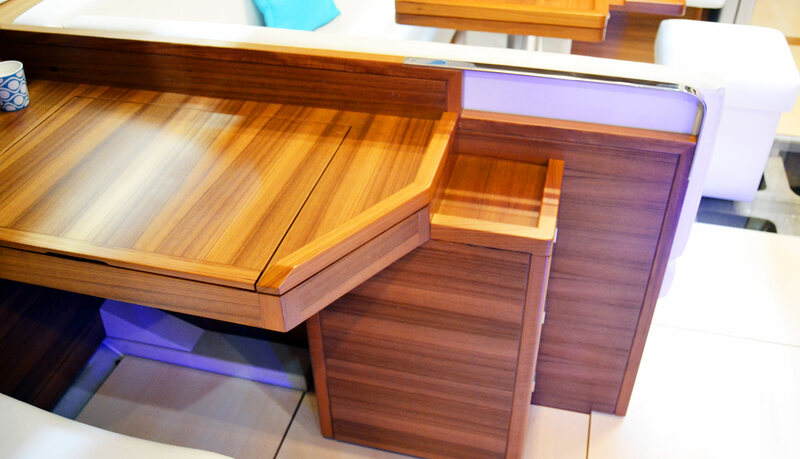 The joinery is – like the woodworks in the boat itself – done with exceptional quality and precision. I admired the massive joinery of the chart table. The edges, although appearing to adhere to the general trend of straight, edgy lines, are actually rounded to prevent bruises when got hit by a body in rough seas. There are more than enough shelves and cases to stow away pencils, papers and books. The main switch panel is huge, there is also a large wooden blank left to mount additional equipment – something also rarely seen on modern cruisers these days. The galley is pure joy. 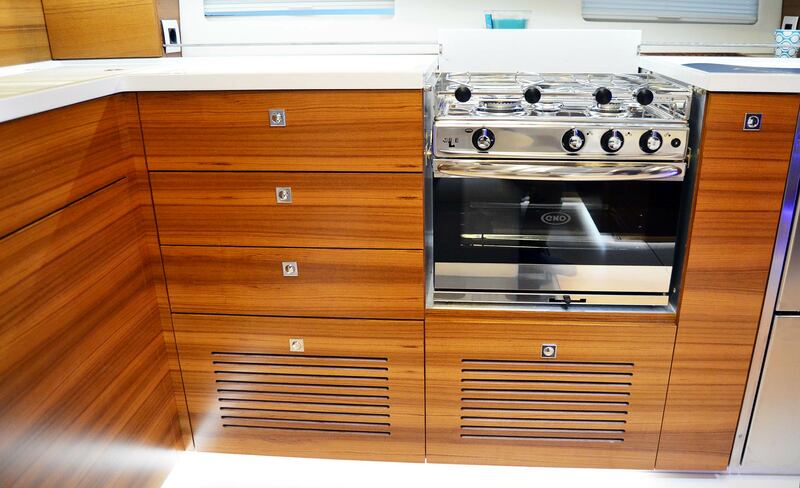 Although I must admit that I personally prefer the classic L-galleys because I don´t like to look at the dishes when seated on the sofa, this galley is made again with an incredible emphasis on design. 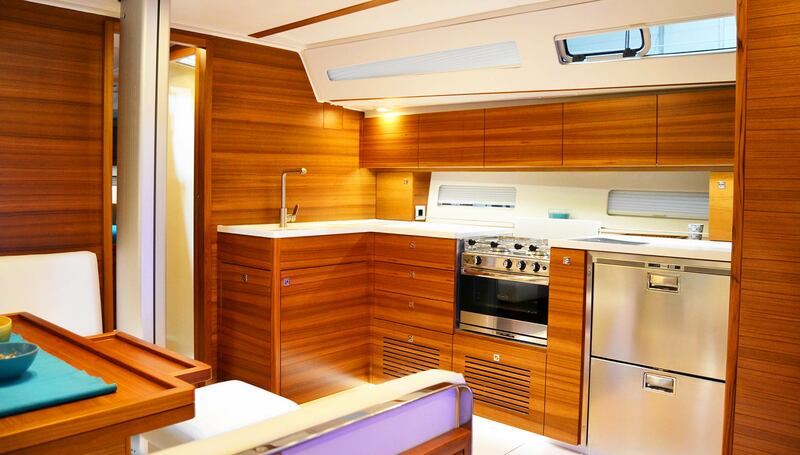 Just look at the wooden panels: The whole galley as well as the bulkhead and all other parts are made with one continuous wooden texture. Amazing! The look this creates is just wonderful, just like sitting inside a tree trunk. What an enormous amount of craftsmanship and effort! What wasn´t quite fitting this beautiful picture of course was the utilization of standard metal fittings but that´s, I guess, the concession to the undertaking of finding a good balance between uniqueness and high quality on the one hand and creating a product that can be successful in a very competitive market. 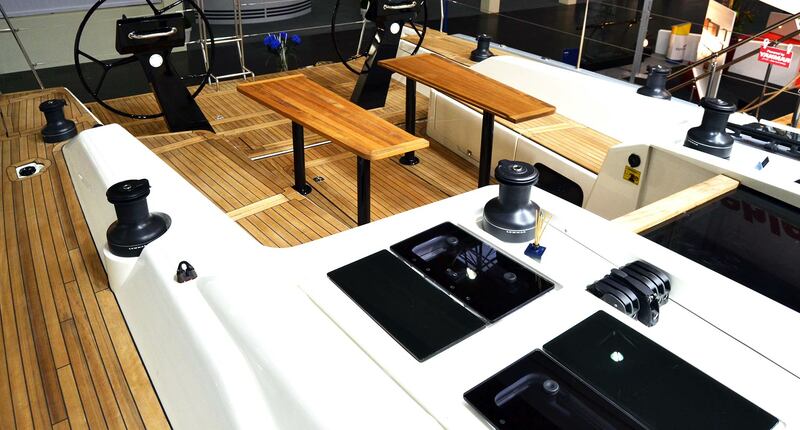 Speaking of details: A clever solution was the overhead grab handles of the More 55 yacht which had been integrated into the coach roof of the yacht all along the full length of the saloon to either sides: Again, massive Teak timber. I loved the aspect of retreating these handles into the roofing so that they also appear as a stylish detail. Cossutti came up with so many nice details here that I was crediting him all the time. “Wait for the engine room”, said the guy who was showing me around and opened the entryway that was folding up. Astonishing. The big 110 hP Yanmar Diesel engine was sitting on a more than solid looking base. All elements of maintenance like filters, levers for cooling sea water and stuff had been mounted well within effortless reach. Thick damping material to either sides of the engine room should guarantee smooth, noiseless running. I could spot the large generator in the back. Everything was so tidy, so clean, so cleverly mounted and spotless assembled that the engine room beared more the character of a cabin than the classic cramped dirty place you normally get on a boat. As little space “wasted” for the engine. Not on the More 55 yacht: Even the lighting was so good that there was virtually no shade whatsoever, which is great for the skipper or the mechanic to work here. 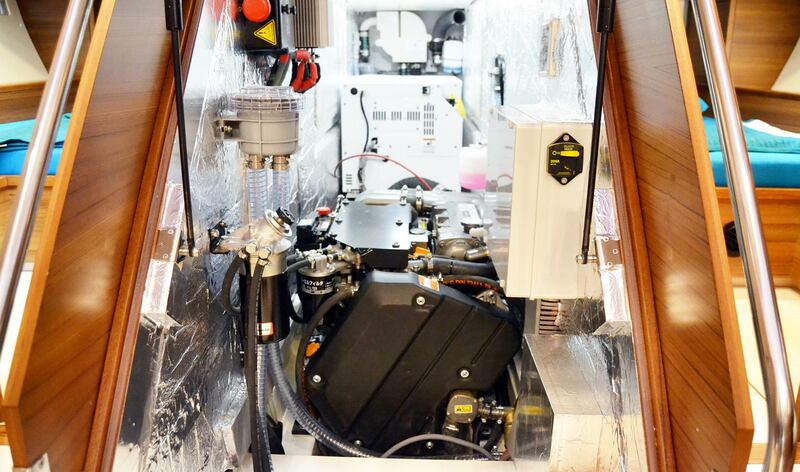 More is so proud of this engine room: The employer told me that Yanmar took photographs of this arrangement of their product inside this yacht and put it in their brochures to show how an engine compartment should be looking like. And indeed, this quality of arrangement I haven´t seen since I sat down with Magnus Rassy in his HR 64. A quick dash to the cabins. You see, I am not so keen on judging a boat by the size and vastness of it´s cabin. 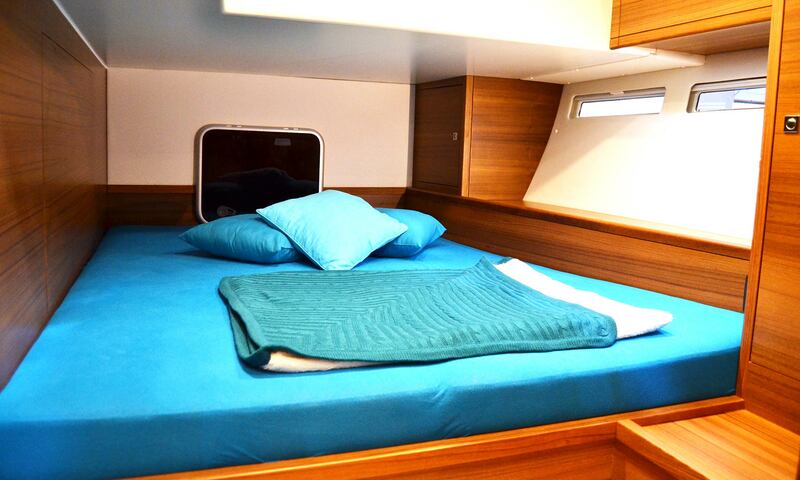 For me, a cabin should provide enough space to find a good night´s sleep, should provide enough stowage for clothing and stuff, should also have an area where an adult can stand freely and get un/dressed without getting hit by the cabin all the time in rough seas and of course the berths should be safe in terms of waves. So, island beds are a thing for anchorage, that´s nothing for being underway in my eyes. 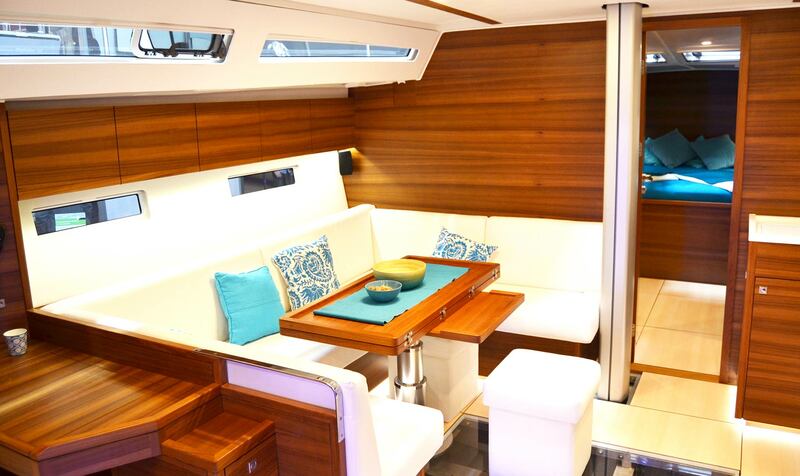 So I was stunned by the owner´s cabin in this More 55 yacht which – I must admit here – was specially made for the owner. But this is how it should be looking like: A full size bed reaching from one side to another. That´s a safe place to lay down no matter on which bow the boat is sailing. No chance of falling out whatsoever. On the other hand, that´s a huge area to find more than enough room for two adults (or more) to sleep. I would go for this option for sure and skip the island bed! Same in the aft cabin: Plain design, no frills here. The woodworks is exceptional again and done with the same amount of effort and quality. 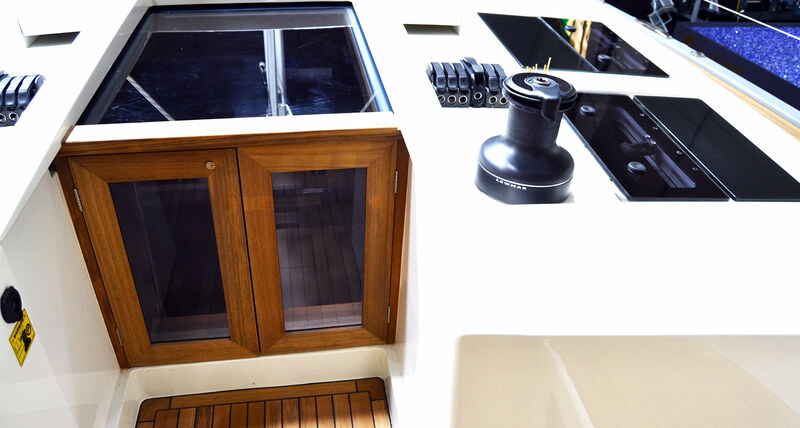 Stowage is sufficient and – here it comes – the thin portholes may seem racy from the outside but won´t provide much of a view from inside the boat. It´s a mere supplier of natural light although I doubt that there will be much of it coming though. Nevertheless, it´s a nice design feature. The More 55 is a modern loft. 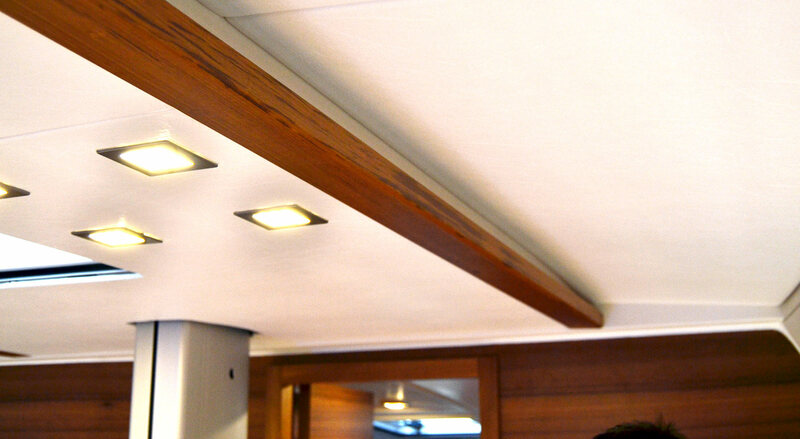 The appearance of the boat is through and through modern, although Cossutti – which I really love – accomplishes the task of using classic wooden material in the interior (darker timber) but without making the boat appear dark. In contrast, the white and shiny leather and fabric on the cushion and some of the decorative panels create a light suffused atmosphere. A really luxurious ambiance. On the other hand, this yacht is a serious racer. One sign for that is the stepped mast sitting right on the massive steel structure. 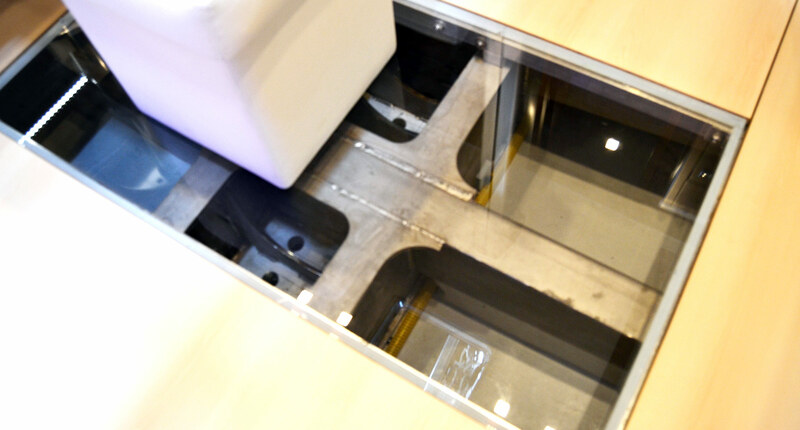 On the boat shown here they had replaced one of the floor plates by plexiglass to show this structure. A rust free steel frame is mounted to the hull, taking on the loads of the shrouds, the mast and also of the keel of course. No doubt: This thing is meant to run at full speed. And fast it can run for sure! The More 55 is simply a Dream Yacht. I leave the boat and I am puzzled. This is my new role model when it comes to performance cruiser. 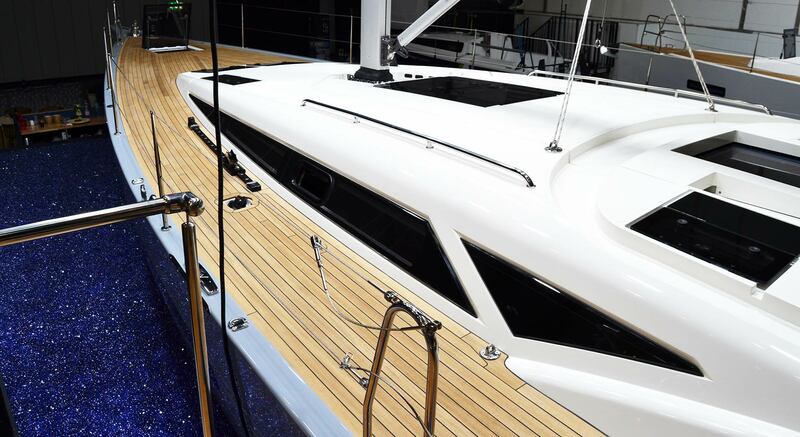 The More 55 is an exceptional boat in so many aspects. 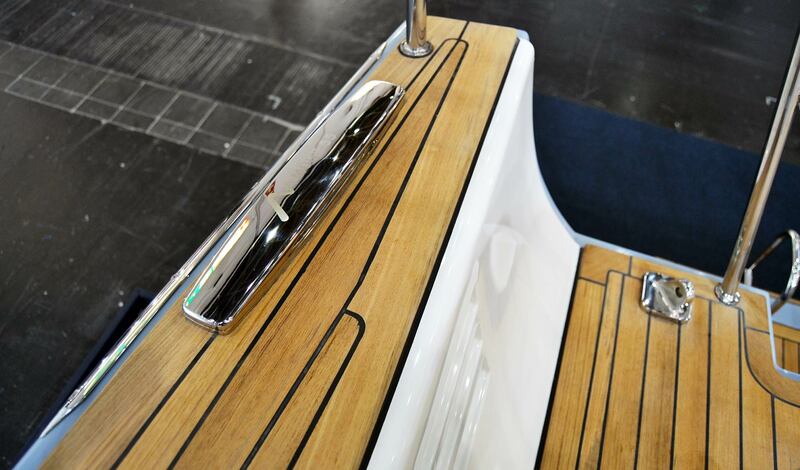 It´s design is fresh and new even for a boat that has been designed almost three years ago. Apart from small details like the slightly too big signature at the stern side the boat looks just mind-blowingly awesome! It must be pure pleasure to see that flat thing running through the seas. It is exceptional as well for its emphasis on detail and the level of quality of the woodworks both outside and inside the yacht. Pure eye candy. The boat´s price is also eye candy. With a starting price around 440.000 Euros ex VAT this 55 feet yacht is a very, very attractive alternative to the big established brands for sure. Again, given the level of craftsmanship this is really the thing. 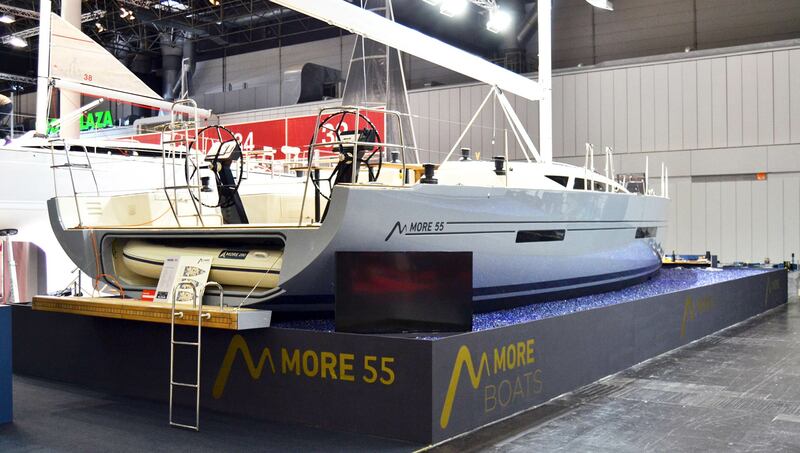 For me, the More 55 was the secret star of this year´s BOOT Duesseldorf and not a few of my colleagues where talking about the boat and asking around: “Have you already seen the More?” Now that I have seen her, I am excited as one can be. Hats off to More, the yard and Maurizio Cossutti. And, by the way, the smaller sister, the More 40, appeared to be made of the same quality and sense for the right things. With a starting price of around 185.000 Euros ex VAT this boat is even more attractive in the bread and butter segment and poses in my view a serious threat to the competitors. Again, after leaving the stand, I was so compelled by these boats that I can´t wait to maybe one days be able to sail one of these. What a great boat!